For Napoleon's brother-in-law, see Camillo Borghese, 6th Prince of Sulmona. Pope Paul V by Caravaggio. Pope Paul V (Latin: Paulus V; Italian: Paolo V) (17 September 1550 – 28 January 1621), born Camillo Borghese, was pope from 16 May 1605 to his death in 1621. He is best remembered today as the pope who persecuted Galileo Galilei. Camillo Borghese was born in Rome on 17 September 1550 into the Borghese family of Siena which had recently established itself in Rome. He was the eldest son of seven sons of the lawyer and Sienese patrician Marcantonio Borghese and his wife Flaminia Astalli, a Roman noblewoman. In June 1596 Camillo was made the Cardinal-Priest of Sant'Eusebio and the Cardinal Vicar of Rome by Pope Clement VIII, and had as his secretary Niccolò Alamanni. During this time, he opted for other titular churches like San Crisogono and Santi Giovanni e Paolo. Clement VIII also bestowed upon him episcopal consecration in 1597 after his appointment as Bishop of Iesi; the co-consecrators were Cardinal Silvio Savelli (former Latin Patriarch of Constantinople) and Cardinal Francesco Cornaro (former Bishop of Treviso). Bishop Borghese retained the diocese of Iesi until 1599. When Pope Leo XI died, 1605, Cardinal Borghese became pope over a number of candidates including Caesar Baronius and Roberto Cardinal Bellarmine; his neutrality in the factional times made him an ideal compromise candidate. In character he was very stern and unyielding, a lawyer rather than diplomat, who defended the privileges of the Church to his utmost. His first act was to send home to their sees the bishops who were sojourning in Rome, for the Council of Trent had insisted that every bishop reside in his diocese. Soon after his accession as Pope Paul V, Borghese determined to humiliate Venice, as his predecessor had done, for attempting to preserve its independence from the papacy in the administration of its government. Paul met with Galileo Galilei in 1616 after Cardinal Bellarmine had, on his orders, warned Galileo not to hold or defend the heliocentric ideas of Copernicus. Whether there was also an order not to teach those ideas in any way has been a matter for controversy. A letter from Bellarmine to Galileo states only the injunction that the heliocentric ideas could not be defended or held; this letter was written expressly to enable Galileo to defend himself against rumors concerning what had happened in the meeting with Bellarmine. Paul V canonised Charles Borromeo on 1 November 1610 and Frances of Rome on 29 May 1608. He also canonized Pompejanus in 1615 and canonized Cardinal Albert de Louvain on 9 August 1621. He also beatified a number of individuals which included Ignatius Loyola (27 July 1609), Philip Neri (11 May 1615), Theresa of Avila (24 April 1614), Aloysius Gonzaga (10 October 1605), and Francis Xavier (25 October 1619). The pope created 60 cardinals in ten consistories held during his pontificate. He named his nephew Scipione Borghese as a cardinal (continuing the trend of nepotism) and also named Alessandro Ludovisi, who would become his immediate successor, Pope Gregory XV, as a cardinal. Paul's insistence of ecclesiastical jurisdiction led to a number of quarrels between the Church and the secular governments of various states, notably Venice, where patricians, such as Ermolao Barbaro (1548–1622) of the noble Barbaro family, argued in favor of the exemption of the clergy from the jurisdiction of the civil courts. Venice passed two laws obnoxious to Paul, one forbidding the alienation of real estate in favour of the clergy, the second demanding approval of the civil power for the building of new churches (in essence, a Venetian stance that the powers of the church must remain separate from those of the state). Two priests charged by the Venetian state with cruelty, wholesale poisoning, murder and licentiousness, were arrested by the Senate and put in dungeons for trial. Having been found guilty, they were committed to prison. Paul V insisted that they be released to the Church. He demanded the release of the priests as not being amenable to the secular law. When this was refused, the Pope threatened an interdict on account of the property laws and the imprisonment of ecclesiastics, which threat was presented to the Senate on Christmas 1605. The Venetian position was ably defended by a canon lawyer, Paolo Sarpi, who extended the matter to general principles defining separate secular and ecclesiastical spheres. In April 1606 the Pope excommunicated the entire government of Venice and placed an interdict on the city. Father Sarpi strongly advised the Venetian government to refuse to receive the Pope's interdict, and to reason with him while opposing force by force. The Venetian Senate willingly accepted this advice and Fra Paolo presented the case to Paul V, urging from history that the Pope's claim to intermeddle in civil matters was a usurpation; and that in these matters the Republic of Venice recognized no authority but that of God. The rest of the Catholic clergy sided with the city, with the exception of the Jesuits, the Theatines, and the Capuchins. The dissenting clergy were forthwith expelled from Venetian territories. Masses continued to be said in Venice, and the feast of Corpus Christi was celebrated with displays of public pomp and "magnificence", in defiance of the Pope. Within a year (March 1607) the disagreement was mediated by France and Spain. The Most Serene Republic refused to retract the laws, but asserted that Venice would conduct herself "with her accustomed piety." The Jesuits, which Venice considered subversive Papal agents, remained banned. No more could be expected. Paul withdrew his censure. The Venetian Republic rewarded Fra Paulo Sarpi, its successful canon lawyer, with the distinction of state counsellor in jurisprudence and the liberty of access to the state archives, which infuriated Pope Paul. In September 1607, after unsuccessfully attempting to lure Father Sarpi to Rome, the Pope responded by putting out a contract on his life. Father Sarpi was the target of at least two assassination plots in September and October. Stabbed fifteen times with a stiletto, Fra Sarpi somehow managed to recover, while the assassins found refuge in the Papal territories. Paul V's hard-edged Catholic diplomacy cut the ground from under moderate Catholics in England. His letter of 9 July 1606 to congratulate James I on his accession to the throne was three years late and seemed to English eyes merely a preamble to what followed, and his reference to the Gunpowder Plot, made against the life of the monarch and all the members of Parliament the previous November, was unfortunate for the papal cause, for papal agents were considered by the English to have been involved (the effigy of Pope Paul V is still burnt every year during the Lewes Bonfire celebrations). However, the Pope in that letter pleaded with James not to make the innocent Catholics suffer for the crime of a few, and Paul V also promised to exhort all the Catholics of the realm to be submissive and loyal to their sovereign—in all things not opposed to the honour of God. The oath of allegiance James demanded of his subjects, however contained clauses to which no 17th-century Catholic could in conscience subscribe: the oath of allegiance was solemnly condemned in a brief published a matter of weeks later (22 September 1606, extended 23 August 1607). This condemnation served only to divide English Catholics. The other irritant (to the papacy) in English relations was Cardinal Bellarmine's letter to the English archpriest George Blackwell, reproaching him for having taken the oath of allegiance in apparent disregard of his duty to the Pope. The letter received enough circulation to be referred to in one of James's theological essays (1608), and Bellarmine was soon fencing in a pamphlet exchange with the King of England. In November 1615, Paul V welcomed the embassy of the Japanese samurai Hasekura Tsunenaga in Rome. Hasekura gave the Pope a letter (from Date Masamune) which requested a trade treaty between Japan and New Spain. The letter also asked for Christian missionaries to be sent to Japan. The Pope agreed to the dispatch of missionaries, but left the decision for trade to the King of Spain. 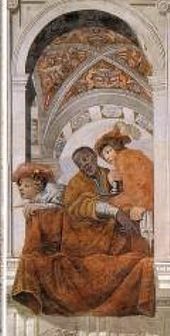 Painting of Emanuele Ne Vunda, ambassador from Alvaro II to Pope Paul V in 1604–1608, Sala dei Corazzieri, Palazzo del Quirinale, Rome, 1615–1616. In Rome, the pope financed the completion of St. Peter's Basilica, and improved the Vatican Library. He restored the Aqua Traiana, an ancient Roman Aqueduct (named after him Acqua Paola), bringing water to the rioni located on right bank of the Tiber (Trastevere and Borgo) using materials from his demolition of the Forum of Nerva. He had always encouraged Guido Reni. Like many Popes of the time he was also allegedly guilty of nepotism, and his nephew Scipione Borghese wielded enormous power on his behalf, consolidating the rise of the Borghese family. Paul V died on 28 January 1621 of a stroke in the Quirinal Palace and was succeeded as pope by Pope Gregory XV. The pope had been ill for more than three months following a series of strokes, and died six hours following his last stroke the morning of his death. Simeone Tagliavia d’Aragonia, Cardinal-Bishop of Albano (1602). ^ "Pope Alexander VII (1655–1667)". GCatholic. Retrieved 10 May 2014. ^ a b "CATHOLIC ENCYCLOPEDIA: Pope Paul V". www.newadvent.org. ^ Charles Bransom, Jr., "The Episcopal Lineage of Pope Clement X & Pope Paul V," Apostolic Succession & Episcopal Lineages in the Roman Catholic Church (blog), retrieved: 2018-09-14. ^ Kelly, Henry Ansgar (December 2016). "Galileo's Non-Trial (1616), Pre-Trial (1632–1633), and Trial (May 10, 1633): A Review of Procedure, Featuring Routine Violations of the Forum of Conscience". Church History. 85 (4): 724–761. doi:10.1017/S0009640716001190. ISSN 0009-6407. ^ Nussbaum, Louis-Frédéric. (2005). "Hasekura Tsunenaga" in Japan Encyclopedia, p. 412. Wikimedia Commons has media related to Paulus V.
"Paul. The name of five popes. Paul V" . New International Encyclopedia. 1905.